Does PC Nextday's laptop for the first-time buyer prove to be worthwhile? PC Nextday is a UK-based manufacturer and its Zoostorm range is its primary laptop brand. The Zoostorm Versa 81- 2200 (£349 inc. VAT) is one of its most affordable machines and, while it fails to match its rivals in terms of quality, it is still a good laptop for first-time buyers. 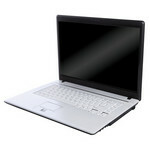 While the Zoostorm Versa 81-2200 is not a bad laptop, it struggles to stand out against other laptops. It has plenty to offer to first-time buyers, but with no distinctive or defining points, it is quite a tough-sell. Entry class dual core CPU with 1 MB level 2 cache and no virtualization technology. Compared to the Core 2 Duo line, some power saving mechanism are deactivated.